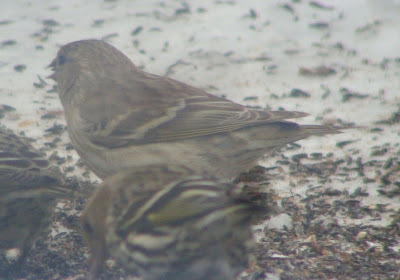 Year after year I continue to notice strange-looking Pine Siskins in small numbers amongst the larger flocks. 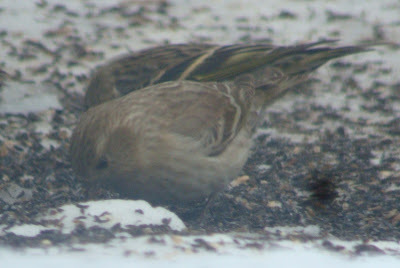 And year after year I wonder whether they could be the so-called 'green morph' Pine Siskin. 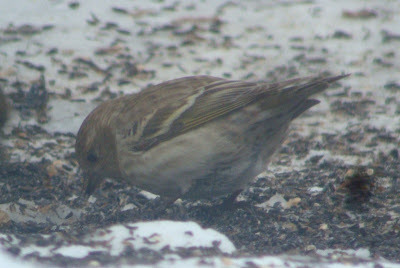 Typically, I end up unsure and move on, usually wondering exactly what a green morph Pine Siskin. 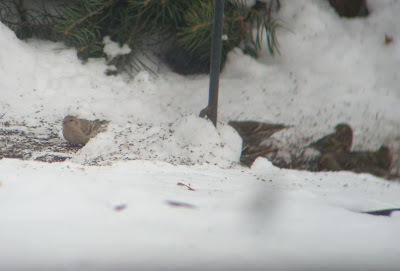 Case in point, this extremely washed-out bird which just showed up at my feeder with about 15-20 others. 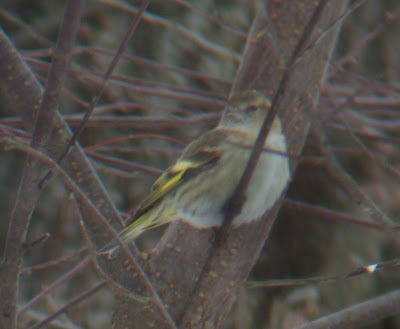 Could this be a green morph Pine Siskin? 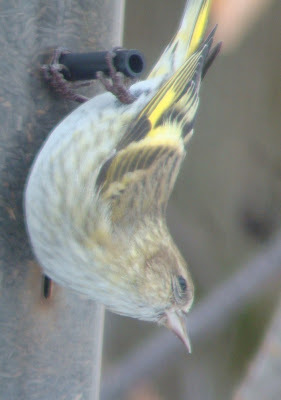 A recent post to Ohio Birds showed photos of 1 such apparent individual, and more importantly included a link to the definitive article on how to identify these birds, focusing on how to distinguish them from the very similar female Eurasian Siskin. 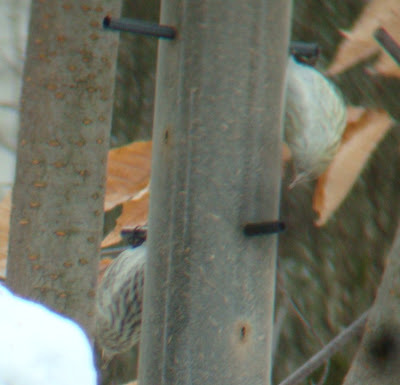 From what I can gather, green morph Pine Siskins are essentially duller brown, washed-out versions of the typical form, with reduced streaking (esp. 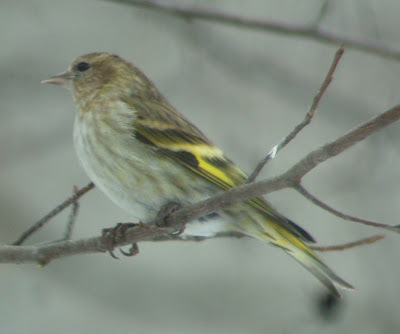 on the flanks and underpars), greenish coloration in the upperparts, yellow in the undertail and uppertail coverts (not all birds), more extensive yellow in the underparts, and a more extensive yellow patch on primary bases. (black) and carotenoids (yellow) are retained (Campbell and Lack 1985)." So, back to my bird. 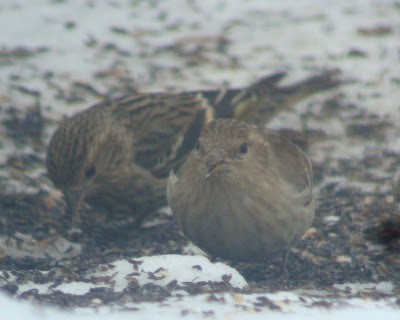 It clearly appears to be a washed-out version of a typical Pine Siskin, with major reductions in streaking below, and very pale brown plumage overall. 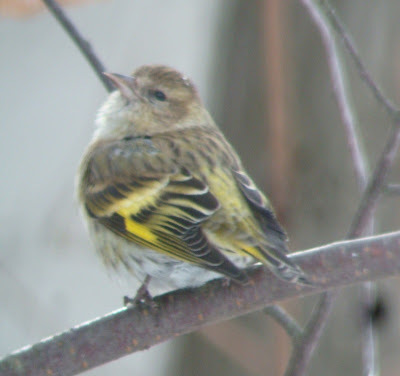 But I see no green hues in my bird at all, no yellow in the undertail coverts, and no more yellow on the bases of the remiges and rectrices than a typical Pine Siskin. It also seems to show no yellow in the underparts. 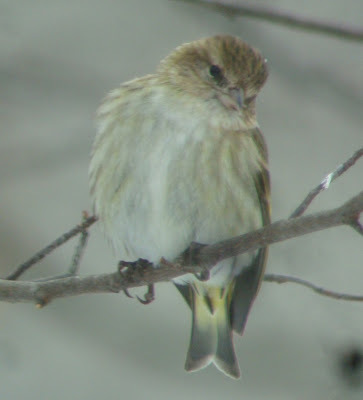 Is this in the acceptable range of variation of green morph Pine Siskins? I don't know (a familiar answer! ), but I certainly am not prepared to claim that it is. 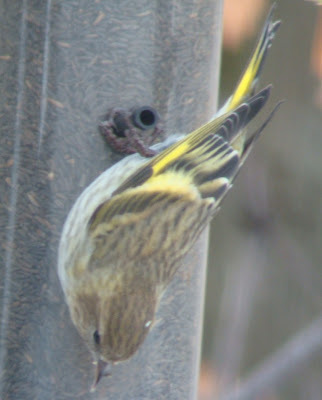 I have seen enough faded-out individuals similar to this one that I think it may just be a pale variant Pine Siskin, perhaps even one with minor hypomelanism (see "Color Abnormalities in Birds: A Proposed Nomenclature for Birders" by Jeff N. Davis, Birding 39(5):36-46. ), a condition in which Davis states there is an "abnormal reduction of melanin concentration from the plumage, skin, eyes, or all three areas". A photograph of a hypomelanistic Common Grackle is seen on page 41 of that article, and seems to be similar in pigment reduction to my Siskin.